This post is for those of you might not realize that Father’s’s Day is THIS Sunday. If you are on the ball and have everything covered, move along, nothing to see here. If you are like me and are last minute at well, everything… this is for you! I have rounded up a few last minute gift ideas that you can purchase online and have delivered to your dad, step-dad, grandpa, brother, uncle, or the man who you just want to say Thank You to. Print out the confirmation or the item on pretty paper and give him a nice card. Would your Dad like any of these ideas? I know mine would! Which idea is perfect as a last minute Father’s Day gift for your dad? Disclosure: This post not only shares ideas for Dad, but also has Affiliate Links that I earn commissions from. This is how I make a living and keep this little blog running. Thank you for supporting me! I appreciate it. Much love, Kristi. From Pale Ales and IPAs to Porters and Stouts, craft beer is delicious and popular among dads. The Craft Beer Club ships monthly, every-other-month, or quarterly. Give the gift of a Craft Beer Club Subscription for Father’s Day and receive up to 3 Free Bonus Gifts plus a Greeting Card in the first shipment. You can gift your dad 1 up to 12 shipments of craft beers. Each month a case of good craft beer is delivered to your dad’s doorstop. If that doesn’t say I love you, I don’t know what does. Cheers, Dad! Order you Father’s Day Craft Beer of the Month Club here. Maybe your dad is like mine and he loves to get his hands dirty in the garden and grow all the things. My Dad loves to grow peppers – the hotter the better. To be honest though, he loves seeing his flowers bloom and takes great pride in his beautiful lawn. If your dad is like my dad, he might enjoy my own organic gardening subscription box, Seed Plant Bloom. Every box comes with 3-10 seed varieties, soil amendment, plus gardening gifts. You can order Just the Seeds, a one-time Father’s Day Box, or a subscription for your Dad to enjoy for the next few months. The best part is that each box is curated based on your Dad’s experience level and plant hardiness zone. Receive 10% off with Code: DADLOVE10 through 6/18. Father’s Day boxes ship all week, cannot guarantee delivery by Sunday. It all depends on when you place the order. So don’t delay, order today! You can send dear ol’ dad everything from a Filet Magnon to a huge Porterhouse Steak. Has your Pops always wanted to try a Kobe burger? Snake River Farms has those too! Yep, they can still get it delivered in time for Father’s Day too! There are a few pretty awesome ideas for the meat-loving Dad. Carnivore Club delivers premium artisan cured meats each month. Every artisan is different. Every box is unique. Whether it’s French Charcuterie, Italian Salumi, or South African Biltong, the premium meat from Carnivore Club is a flavor experience your Dad won’t soon forget. I don’t know about you, but my Dad is the Master of the Grill. The Grill Masters Club was made for men like him in mind. Each month receive BBQ rubs and spices that taste great on all kinds of meats, chicken, or fish. The Grill Masters Club will kick Dad’s BBQ up a notch. Maybe your Dad would like lobster with his steak, or loves fresh Maine lobster just a bit more. Let Dad enjoy a fresh Maine lobster delivered straight to his door – overnight, guaranteed. Lobster Anywhere specializes in Live Maine lobster and frozen lobster tails. You can add crab legs too. Yum! Free Shipping on Father’s Day Gifts. Click here. 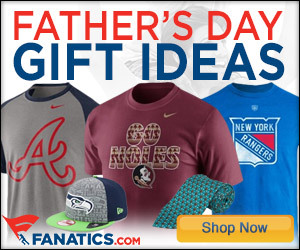 Whether your dad is a football or baseball fanatic or can’t get enough of the World Cup, over at Fanatics.com they have Dad covered for all his sports’ needs. From college to professional, there are more things to choose from than you could possibly imagine. Check them out for yourself. Also check out their sister store, Fans Edge… seriously everything the Sports Fanatic Dad could every want! Fun and funky socks are a way of life for more than one dad! Why not have fun socks underneath a business suit or when you head to the gym? Choose between either Stylish & Suave, Daring & Bold, or a combination of the two with Sock Panda. You can have 1- or 2-pairs delivered to your pop each month. I know a lot of fathers who enjoy a delicious high-quality artisan wines. Now you can have curated wines delivered monthly or quarterly and introduce your dad to some wines he might not have had on his radar. The California Wine Club delivers monthly or quarterly. Treat Dad to a 3-month (or more) wine club membership from The California Wine Club and he will also receive a bottle of sparkling wine in the first delivery, no code need, exp. 6/30/18. Every month different types of coffee are sent to your Dad to try out. It’s like his own blind tasting with coffee. A fun thing about this coffee subscription box is that they have their own tasting app! Record tasting notes on the coffees you try and compare answers with the community and roaster! It takes loving coffee to a whole new, awesome level! Dear ol’ Dad will love it! This Father’s Day gift starts at just $9.99 too! Join the Coffee Tasting Club here!